Mauro Icardi has been hailed as a "perfect" striker by Inter boss Luciano Spalletti after the Argentine's winning goal against Udinese. Icardi scored with a brilliant Panenka in the 76th minute at San Siro, ensuring Inter won 1-0 despite a lacklustre display. The 25-year-old had earlier missed a golden chance to put Inter ahead, heading wide from six yards out, with the Nerazzurri having struggled to break through Udinese's stubborn rearguard. 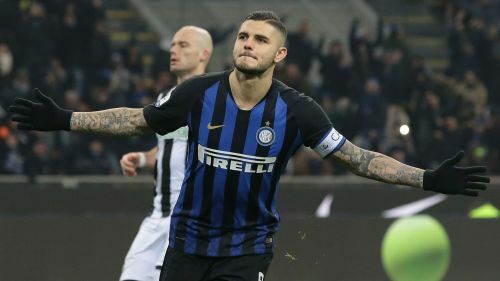 Spalletti, however, insists that Icardi – who also scored in Inter's 1-1 draw with PSV in the Champions League on Tuesday – is now a complete forward. “He completes the work of the team as the perfect centre-forward," Spalletti told Sky Sport Italia. "There are times when the opposition press you and you have to go behind the line to find the ball. "In the last couple of games, Icardi has done that perfectly." Inter were far from at their best on Saturday, creating little despite controlling possession. Although Spalletti was pleased with his side's patience, which eventually paid off when VAR was used to deem that Seko Fofana had handled in the area, he acknowledged they must play at a higher tempo. "We did okay, but didn't have the right level of intensity," Spalletti added. "The ball has to be flung towards the goal, not passed slowly to give time for the opposition defence to reorganise. "Aside from the start of the second half, when we got a bit unbalanced in a bid to break the deadlock and send a signal this game had to be won, we otherwise controlled the match."